61 ­Jesus was aware that his disciples were complaining, so he said to them, “Does this offend you? eternal life. Human effort accomplishes nothing. even his brothers didn’t believe in him. but it does hate me because I accuse it of doing evil. also went, though secretly, staying out of public view. was a lot of grumbling about him among the crowds. 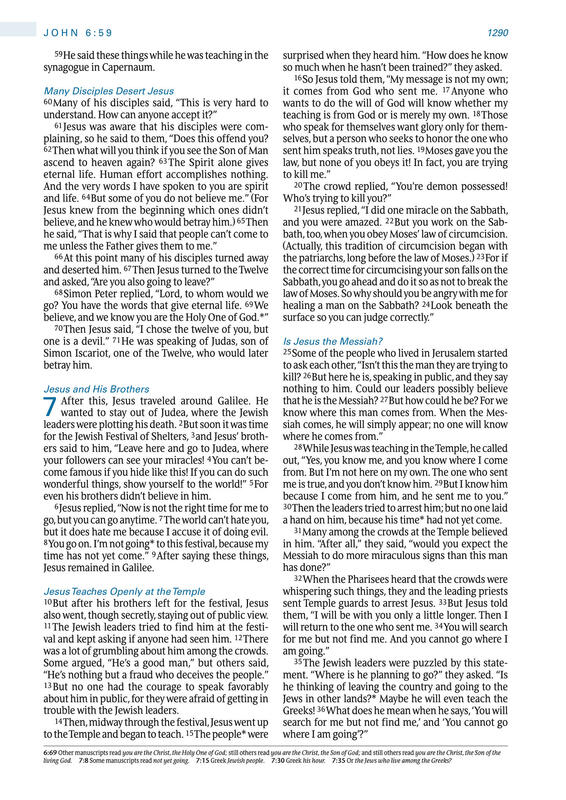 trouble with the Jew­ish leaders. so much when he hasn’t been trained?” they asked. 20 The crowd replied, “You’re demon possessed! bath, too, when you obey ­Moses’ law of circumcision. a hand on him, because his time* had not yet come. living God. 7:8 Some manuscripts read not yet going. 7:15 Greek Jewish people. 7:30 Greek his hour. 7:35 Or the Jews who live among the Greeks?